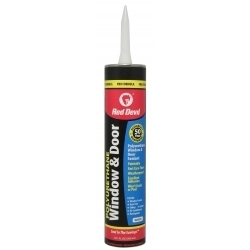 Window and Door Polyurethane Sealant is a premium grade, high-performance sealant designed specifically for installing or repairing door and window frames and sealing all types of siding. It provides superior adhesion to most building materials and is excellent for sealing out the elements and increasing energy efficiency. It is paintable, non-staining and remains permanently elastic. Cured sealant is mildew resistant.